You might wonder what a picture of a swimming pool has to do with whisky. Well, while you won't swim in whisky in this pool, the water in the pool is heated with waste heat from Bowmore Distillery. Bowmore Distillery just won the Green Apple Award for this policy. 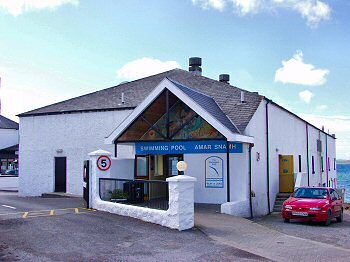 The pool is a community project and to my knowledge Bowmore provides the heat for free, a solution which helps everyone. The pool receives help with funding while the distillery can dispose of the heat while supporting the community. I'll participate in the Islay Walking Week in April. I'm very much looking forward to it, I'm sure it will be excellent again. I went on one walk last year (unfortunately couldn't make the other ones) and it was great. While I'm there I also plan to visit Islay House Square and in particular Islay Ales, hoping they will be up and running by then. 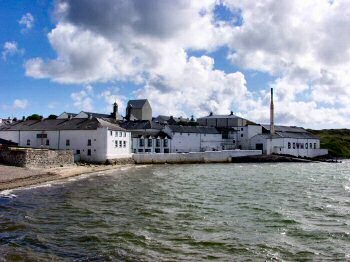 Islay Ales doesn't seem to have an own website (yet? ), so I haven't been able to find out much more about it. Should anyone from Islay read this and know more, please e-mail me. I don't think I had even heard the word whisky at this age. But I seem to have enjoyed taking a bath. 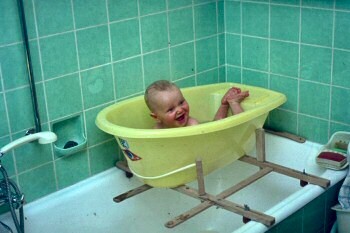 I later graduated to the big bathtub, but that was a few months (years?) later.